Do you need to generate leads for your business but don’t have a website? Or maybe you have a website but don’t want to create a landing page for a new campaign. With Facebook, you can generate leads within the platform. Users never have to leave Facebook, and you still get the leads you need to start a sales, outreach or marketing project. In this article, I’m going to explain what Facebook leads are, how to set them up, and give you tips for the best chance of success. 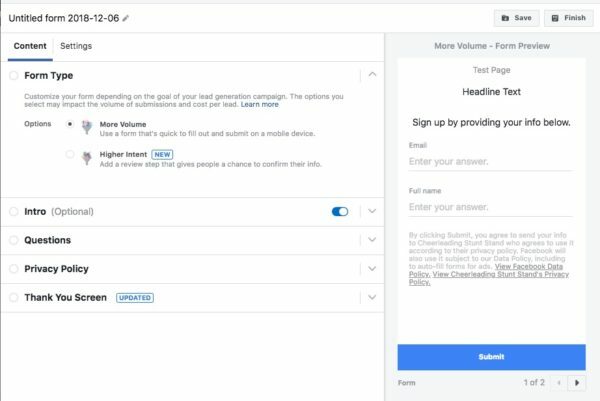 Facebook lead ads allow you to create an ad and attach it to a lead capture form that loads within Facebook for a seamless user experience. They are a great way to get a lead generation campaign going without needing a website or a landing page. Facebook came out with lead ads over three years ago. One of the things I initially liked about these lead forms is that they collect user information directly from Facebook, which makes submitting the form take mere seconds. For the purposes of this article, I’m going to assume you know how to create a successful Facebook ad, so we’re going to skip most of the ad setup. The only thing I will say is that you need to choose the lead generation objective when creating your campaign. If you’re a beginner, I recommend checking out their free course Facebook Blueprint. You will need to read, and agree to, their Lead Ad Terms before publishing your campaign. You can do that after reading this article. Within the ad creation, you will see a section for the ads. You can either create a new form or use an existing one. Choose the option to create a new one. You will then get a popup to duplicate an existing form or to make a new one. Let’s make a new form. There are a lot of options here. Instead of overloading you with pictures of each step, I will let you go through it. The form itself is very self explanatory. And I will share some tips in the next section to help. Click the Settings tab and choose the option to leave your form open. If it is restricted, then only the people that were shown the ad can fill it in. I set it open because a lot of times people will tag someone that will be interested in the offer. If they want to fill it in, I don’t want Facebook to prevent them from doing so. Don’t overload this page with too much text. Your ad already got them interested. Now you just need to get their data. To prevent being too wordy, I usually recommend using “Bullet Points” instead of “Paragraph” in the Intro tab. As I mentioned earlier, one of my favorite features is that consumer data is already within Facebook, and it will automatically load it on the form. This makes it easy for people to submit a lead. Unfortunately it is too easy. In my first campaigns I chose fields that were automatically generated. The user just had to hit submit and then I had the lead. Sadly, I had a hard time reaching these people. When I did get a hold of them, some of them mentioned that they didn’t submit the form. Since it was so easy, they were accidentally able to submit their information. I even had someone said that their kid was playing with their phone, and they must have submitted it unintentionally. I usually like to practice the path of least resistance: the easier you can make it for people to complete your desired action, the higher the probability of them doing it. In this case, it actually hurt my campaign. To fix this, I decided to only use the pre-filled options for information that wasn’t critical, such as name. Then I created custom fields for information that I deemed critical—phone number and / or email address. There were no more accidental submissions since people had to type their information. It ensured we had the best information to get a hold of them. If you’re like me, you probably use a different email for Facebook than your primary email address. So if an automatically generated form uses that email address, then I will probably never see a message sent to it. By having people type their information in, it shows that they want to be contacted about your offer. Another tip to help with your campaign is also along the lines of the path of least resistance. Only ask for information that you actually need. If you just need their name and phone number, request only those two things. Each additional field is another opportunity to lose someone. If you don’t absolutely need it, then leave it off your form. You can get more details when you are on the phone with them. If you have tried to run ads on Facebook before and they didn’t work out for you, check out our article about Why Facebook Ad Campaigns Fail and How to Fix Them. It breaks down different ways to give your campaign a greater chance at success. Now that your campaigns are running, you need to extract your lead data. The easiest, and free method, is to download them straight from Facebook. 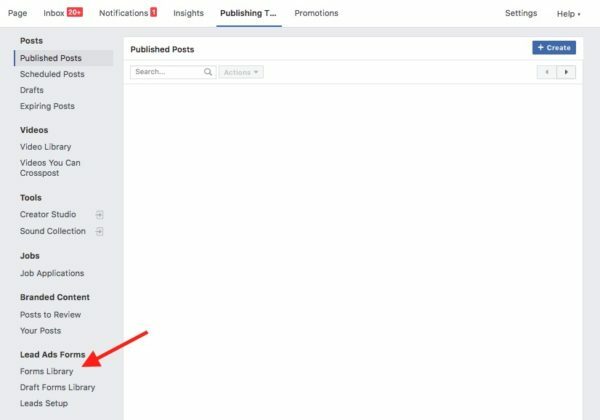 Go to your Facebook page and find the Publishing Tools tab. When this page has loaded, find the Lead Library on the left column and click that. From here you can choose which form you’re looking for and download your leads. That’s the free method, and the one that I recommend for most people. There are other ways to extract your leads that include paid tools. In many cases, you would need to use the premium version of Zapier to automatically send your leads to your favorite CRM software. You can even have it send you leads via texts! This video from Facebook will give you some information on how to integrate your leads. Pro-Tip: You can use Zapier Premium free for 14 days. I’ve created free accounts for new clients and setup the automated texts for their leads just to get the ball rolling. If the campaign is making money, the cost of Zapier premium is definitely worth it. Plus if you haven’t used Zapier before, it’s a pretty cool way to automate things in your life. 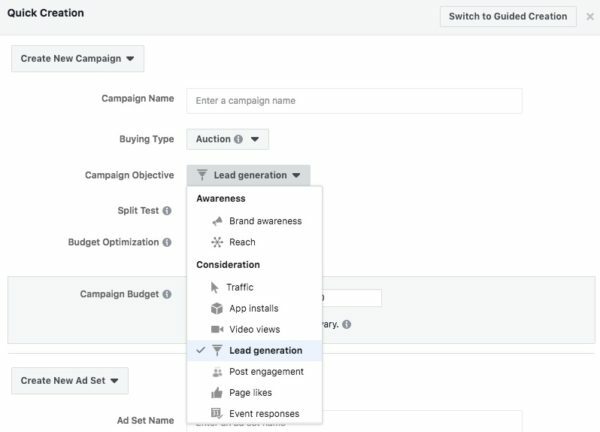 I personally really like the Facebook Lead Generation objective. Especially when working with clients that focus more on leads than direct conversion campaigns. It’s very simple to setup and can be extremely effective if you know what you’re doing. Hopefully after reading this article, you will know what to do and see good results. What you do with your leads, well, that’s entirely up to you! Facebook is a massive platform with massive potential to help you generate leads. That, of course, takes planning and then the data must be managed. ProjectManager.com is a cloud-based project management software that allows you to track your leads in real time. Try it today and see how it can help with this free 30-day trial.